Imagine you are stumbling along through pea-soup-thick darkness. You can’t see a thing, even your own feet or one step in front of you. And then, out of nowhere, the heavens rumble and there is a mighty lightning flash. All of a sudden, the entire world is so clear. The road, the trees, the houses, the people. But a few seconds later you are plunged into blinding darkness yet again. But that fleeting burst of light still guides your feet, even through the pea-soup-thick darkness. This is life in this world. The darkness that surrounds us is pea-soup thick and we can’t see God at all. There is so much suffering, so much injustice, so many people inflicting so much pain on others. And then there is a lightning flash, a moment of clear Divine Providence that enables us to finally really see Hashem’s guiding hand even at the darkest moments in our lives. Over the past while, the darkness has been feeling especially thick in the world around me. So I have been clinging to my most recent lighting bolt: the events of my miraculous birth two months ago. But it’s still not easy for me. It’s not easy for me to remember that Hashem is here when things around me feel so dark, but I’m trying, JewishMOM. I’m really trying. 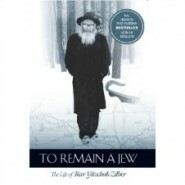 I’ve just started reading a phenomenal autobiography called To Remain a Jew: The Life of Rabbi Yitzchak Zilber. Rabbi Zilber is a man who achieved the nearly impossible by remaining an observant Jew in Soviet Russia. Stalin and the Yevsektsia closed the shuls, the Jewish schools, the mikves. They made it illegal to sell kosher meat or perform circumcisions or to keep Shabbat. Even believing in God and expressing that belief meant that a person could be taken away in the middle of the night, never to be heard from again like the other 13 million people that Stalin executed or who died in his prison camps. But Rabbi Zilber experienced lightning bolt after lightning bolt that enabled him to see Hashem’s providence despite the nearly impenetrable darkness that did not lift for 70 years of Communist rule. Through miracle after miracle Rabbi Zilber managed to keep Shabbat for years even though he was required to work. Through miracle after miracle he managed to stay out of the Komsomol, the nearly mandatory Communist Youth Organization, where membership was conditional on a public declaration that there was no G-d. Through miracle after miracle he managed to get accepted to university (where he wanted to study so that if would be easier for him to keep Shabbat) even though he met none of the admission requirements, and managed to excel even though he was often unable to prepare for tests, again, through miracle after miracle. Rabbi Zilber’s life is like a non-stop lightning storm. I guess that was what Hashem knew was necessary to guide him through darkness as dark as Stalin-era Russia. The following story is one of the brightest lightning bolts in this incredible book. And I think that maybe this lightning bolt is bright enough to light up the darkness to this very day. I was a boy when people who came from Minsk to Kazan [where Rabbi Zilber grew up] bitterly told my father how in Minsk the old Jewish cemetery was being desecrated. Government construction workers had removed old bones from the graves, and had built a stadium for the NKVD [the predecessor of the KGB] on the cemetery site itself. This wasn’t simply the work of hoodlums; it was an official government decision to destroy the cemetery. There was no way to stop it…. “They couldn’t destroy it,” those people said. As a young boy I thought: people like to exaggerate…But in 1953 Shalom Isaakovich, a famous doctor from Minsk, knowledgeable in Torah and carefully hiding it, came to Kazan. I asked him whether the grave of the Seder Hadoros had been saved and he confirmed it. I could not figure out how it happened that the whole cemetery was destroyed but the grave of the Seder Hadoros was left. I still found it hard to believe. Many years passed. In 1962 my son Benzion and I visited Samarkand, where my old friend Yaakov Barashansky lived. Reb Yaakov was a native of Minsk, so I decided to take advantage of our time with him and find out once and for all what parts of the story were true or not. I would ask the questions and Benzion would be the witness. I knew that I could trust this sincere man– he had never lied in his life. Reb Yaakov answered that he knew the story of the grave very well. “Our neighbor was a Jew who worked at the cemetery. He was [very assimilated], but after the story of this grave he started putting on tefillin every day. There stood a tomb on top of the Seder HaDoros’s grave. When the Soviets were dismantling the cemetery, two workers climbed on top of the tomb. Both fell down. One died and the other broke his leg. May Hashem always bless us with much light to guide us through the darkness…Happy Chanukah, JewishMOM! Love the story! Thank you so much for writing about this, it is very inspiring and educational, especially for our children. wow. now i want to read the book. thank you for sharing.